This overview map shows the sprawling outline of the proposed 300-megawatt Hecate Highland Energy Solar Power Generation Facility. The Ohio Power Siting Board approved the siting permit for the Willowbrook Solar Power Generating Farm Thursday afternoon, and Doug Herling of Open Road Renewables said approving the certificate paved the way for construction of the 150-megawatt facility, which is scheduled to begin late next year. If finalized, the Willowbrook facility will occupy approximately 1,500 acres in southern Highland County and the northeast corner of Brown County, following U.S. 62 northward and ending at the Old Y Restaurant. 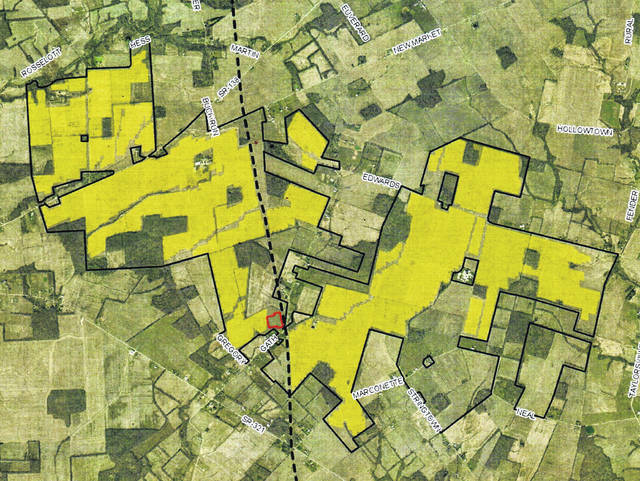 Dr. Evan Blumer, project director of the Appalachian Ohio Solar Job Network, said the neighboring Hecate Highland Energy project in the Mowrystown area was moving through the approval process with the hope of a similar outcome in the next few weeks. Randy Drewyor, treasurer for the Bright Local school district, told The Times-Gazette an informational meeting was held Thursday night at Whiteoak High School to give residents a better understanding of the proposed Hecate Solar Power Generating Facility that is to be located north and west of Mowrystown, between Mowrystown and Buford. Representatives from the Ohio Environmental Council, the Sierra Club and Hecate Energy were on hand to answer questions regarding the Hecate timeline and solar power in general, and Sierra Club representative Becca Pollard said the meeting was relaxed and informal, and addressed the concerns of the 15 to 20 persons who were present. Blumer said that Sam Randazzo, who was appointed by Gov. Mike DeWine as chairman of the PUCO earlier this year, was confirmed by the Ohio Senate Energy and Public Utilities committee on Tuesday and will take his seat April 11 after a full vote by the senate. According to a news release from the Ohio Solar Jobs Network, both the Willowbrook and Hecate projects will be some of the first projects to be decided upon when Randazzo assumes leadership of the PUCO, which is a concern since he has come under fire following his appointment to previous positions where he opposed clean energy progress in Ohio. The Hecate facility’s adjudicatory hearing before the PUCO was March 26, and based upon the progress seen in the Willowbrook hearing, Blumer said the certification decision on Hecate could come in early to mid-May.